Mrs. C is the Lead Teacher for the Mixed-Age class. Carrie has a BA Degree in Child Psychology and Political Science from the University of Michigan. In addition, she has attended and presented various workshops and training in early childhood education. Besides her experience with raising three girls, she has been a Head Infant/Toddler teacher, Assistant Director at Gretchen's House, Nursery Director at the First United Methodist Church in South Lyon, and a Parent’s Time Out program instructor for children aged two to five years. Carrie is also the Early Childhood Manager at Oak Pointe Church. 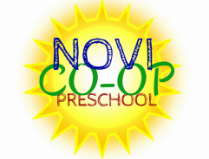 She has been a co-op parent with all three of her children, two of whom attended Novi Co-Op Preschool. Carrie has been teaching at Novi Co-Op since 2008. Ms. Kari is the Assistant Teacher for the Mixed-Age class. She provides the favorite lap to sit on at circle time, and her own three children attended Novi Co-Op. As a former Novi Co-Op parent and Board Member, Kari is an amazing asset to our program, helping parents and children bridge the gap between home and school. Kari holds a BA in Communications from MSU, and has been teaching at Novi Co-Op since 2014. Ms. Kristen is the Parent-Tot Teacher. She has a Bachelor’s Degree in Early Childhood Education from Central Michigan University, and has been Head Infant/Toddler Teacher and Program Director for Gretchen’s House Learning Center. Kristen is a former Novi Co-Op parent, is mom to three children of her own, and nanny to three more. Kristen brings a wealth of experience to the classroom.